The press notices included in the appendix to my Everyman edition of The Three Imposters (1895) testify to the almost universal revulsion this novel induced upon publication. The Liverpool Mercury - which one must assume comes down firmly on the side of the necessity of moral fiction - reported that “(n)o one can be made happier or better by such a book as this, but on the contrary the reader’s mind is likely to become stored with images and ideas that cannot but have an undesirable effect.” The Liverpool Courier was even more blunt in declaring “Ugh! A more repulsive catalogue of horrors it would be difficult to imagine, and its existence can only be attributed to the occasional perversity of man.” Other reviewers simply found the book unimpressive, and derivative of the recent work of Stevenson, particularly his New Arabian Nights, a debt which Machen seems to readily acknowledge in his characterizations and plot devices. In short, Machen tended to be seen as a sensationalist, dwelling on the ugly and repulsive, and making the clear choice of reveling in the descriptive horror of the grotesque, rather than leaving anything to the imagination. 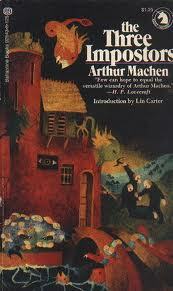 Machen himself disavowed all but a couple of episodes in the book. From a distance of more than a century, we can appreciate the book on its own merits, and recognize its publication as a signal event in the development of the fiction of the weird and uncanny. 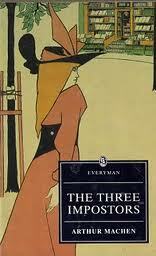 This novel is, to me, greater than the sum of its parts, although the parts have merit on their own. Within the frame story of the elusive character of the “young man with spectacles” the book is largely a collection of tales of the demonic and grotesque, there are weird tentacled humans, dripping with slime such as might warm the heart of a Lovecraft fanatic (as it did Lovecraft himself), a Jekyll and Hyde character (another homage to Stevenson) who taps into his atavistic demons in the “Novel of the White Powder”, and a secret society whose tentacles are metaphorical, if none the less deadly. There are scenes of grisly torture, and a moment or two of grim humor besides (note: always read the instructions for your new torture devices before operating!). The novel utilizes a minor “a long the riverrun” device, and I can’t imagine turning the last page without proceeding immediately to the first, as the ending elucidates the Prologue. Beyond the individual stories told by the so-called “imposters”, there is an undercurrent of deception and evil intent. The imposters are on the trail of the gold Tiberius, a rare talismanic coin which serves as this novel’s macguffin. The central pigeon is a Mr. Dyson, a hapless figure only slightly less clueless than his friend, Mr. Phillipps. It is he who hears from the imposters the series of improbable tales regarding the (supposedly) sinister young man with spectacles, and the two are witness to the morbid denoument in a dilapidated mansion on the outskirts of London. 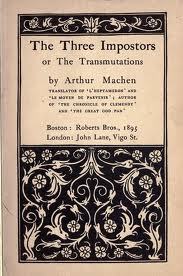 The Three Imposters is an extended piece of strange fiction which enthusiastically utilizes Machen’s favorite themes of cruel human obsession and demonic atavism as presented in The Great God Pan and The Hill of Dreams. It is an entertaining work, with a nice balance of horror and humor, and it has survived its critics to become a classic of the genre.